Yes, those were the words coming out of Dan’s mouth after Sunday dinner this week. Ahh, so pleasing to my ears. Dan is a really good sport. Sometimes my cooking experiments don’t always turn out great. Plus, he’s not as adventurous of an eater as I am, so while I think it’s fun to try Teff Porridge, he’s a bit hesitant. So I must share this beautful meal with you. 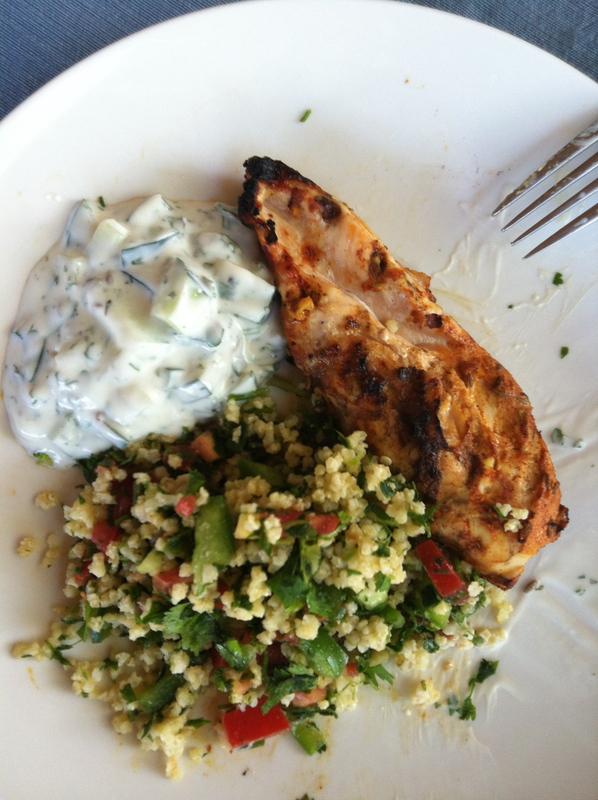 Starting from Cooking Light’s Tandoori Grilled Chicken with Mint Raita, I added Indian Spiced Millet Tabouli and modified the chicken marinade and raita slightly. Start by clicking here and print out the recipe for the chicken and raita. I’ll cover the ingredients and basic steps below, but you may like to refer to the original recipe. Read through this recipe and the instructions I have below so that you understand all the steps. These are really simple recipes, but I haven’t written this up in way so that you can make three things at one time and get it all done efficiently. Bring water to a boil. When boiling, add millet and cover. Let simmer for 20-30 minutes until the water is absorbed and the millet is no longer crunchy. While the water boils, put together the marinade for the chicken. I believe this would also be a delicious marinade for extra-firm organic tofu. Blend yogurt and all ingredients above, except chicken, in a Vitamix or food processor. This is your marinade. Place chicken in the marinade and refrigerate at least 1 hour in an airtight container. Since I didn’t have enough yogurt for the both the chicken marinade and the raita, and because I had old buttermilk in the fridge, I used buttermilk in the marinade for the chicken. I also used boneless, skinless chicken rather than bone-in chicken that was used in the original recipe. If you feel the need you can rinse the food processor or blender between the marinade and the next step. Since the flavors all combine nicely I didn’t bother with a rinse. Next, mince the herbs, garlic and ginger. 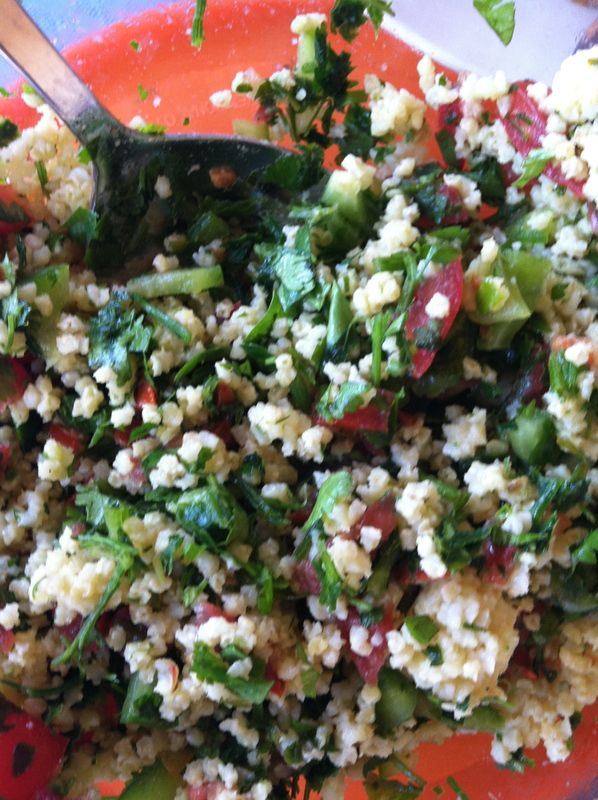 Using a Vitamix or food processor mince parsley and cilantro for the raita and tabouli. Set these aside. Then mince the ginger and garlic. Dice the cucumbers. Mix the cucumbers with yogurt, and a handful of cilantro and mint. Add the cumin and salt. Mix together and refrigerate. Dice the tomato and bell pepper and place in a large mixing bowl. Combine all the ingredients and mix together thoroughly. Place in refrigerator until ready to serve. Season with salt and pepper and more olive oil and lime juice if desired. Before grilling the chicken, set it out of the refrigerator to come to room temperature. This helps the chicken stay moist when you grill it. Grill chicken and enjoy! There may seem like a lot of steps and ingredients, but this is a pretty quick-prep meal. I made everything in about 30 minutes in the morning and didn’t have to do anything but grill the chicken when dinner time came around. It was perfect! Who Can Eat Domino’s Gluten Free Pizza? These dishes look fantastic. Can’t wait until I can add back cucumber into my diet!